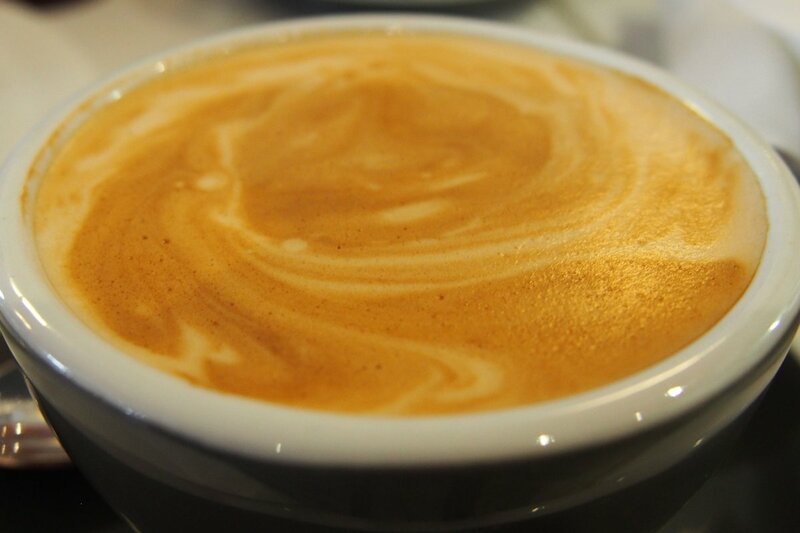 The coffee ($4) was the perfect hit to wake each of us out of our Sunday morning slumps. You name it, they serve it here. Bottomless leaf tes ($5), chai latte ($4.70), iced coffee, coffee frappe ($5 each), house lemonade ($5.50), fresh juice ($6), frappes, smoothies ($6 each) and more. Get the picture? 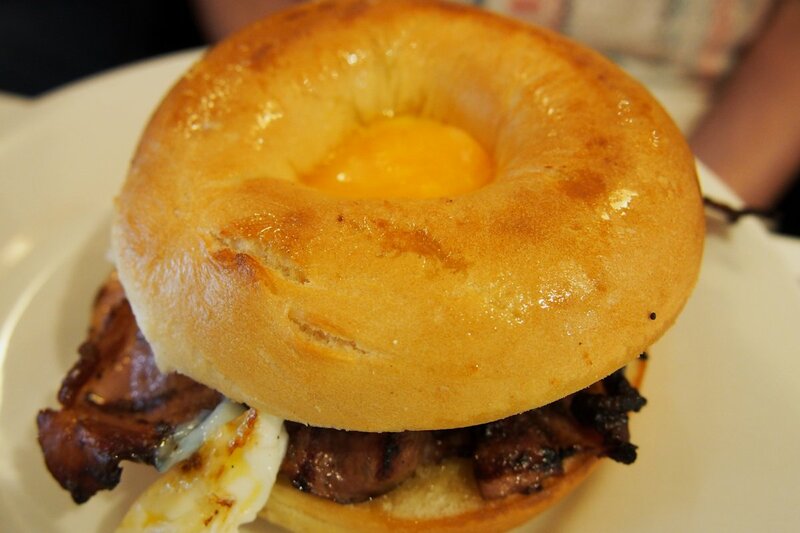 Looking at the egg and bacon bagel ($8) (which isn’t on the menu but they made it for one of my guests anyway), I am wondering why more places don’t offer this! It presents beautifully with the yolk in the middle. As with so many of our dishes this morning, the bacon is the king here. Chargrilled and cripsy yet thick enough to allow you to savour all of the flavour, it’s a cut above what you’ll find in most other cafés. I’ve raved about this egg & bacon roll ($8) and I’ll do it again. Superb quality roll, oodles of cheese (only $1 extraso why would you not), enough of that chargrilled bacon to offend the vegetarian sitting next to you and fried egg with succulent, runny yolks. 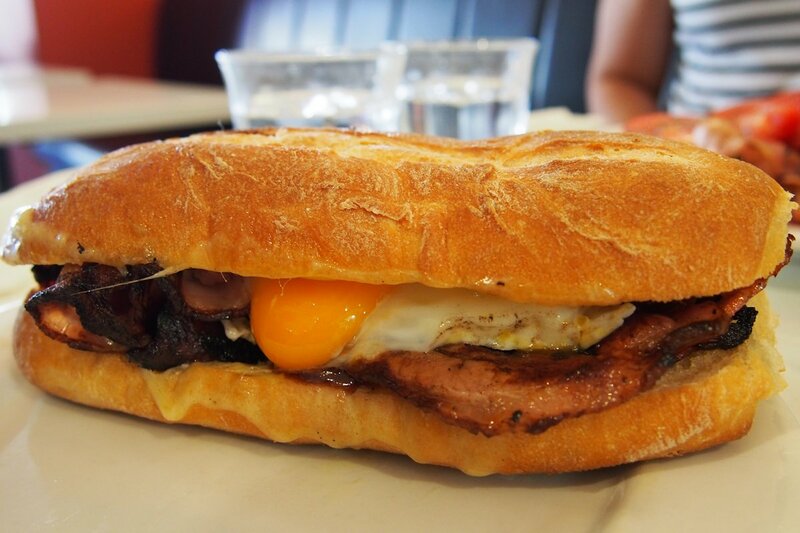 Add your choice of sauce and this is easily one of Sydney’s best bacon and egg rolls. 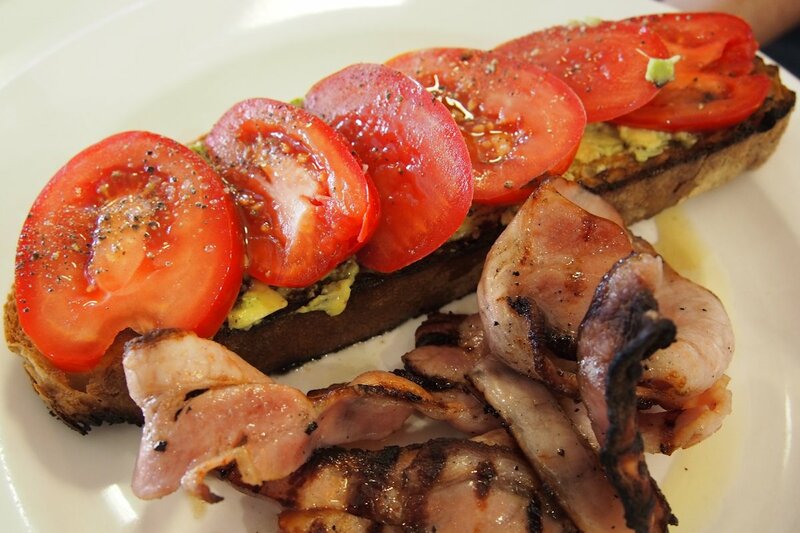 The avocado & fresh tomato (half serve $7, full serve $12) uses fresh ingredients and lets them do the talking. What you see here is just the half serve! Most dishes are available as half servings which is something I don’t see anywhere else but a much needed offering (not for me mind you!). The mountain side of bacon was $4. Perfectly seasoned with a touch of salt and a lot of pepper and served on thick but easy-to-cut sourdough, you’ll have a hard time finding a better example. 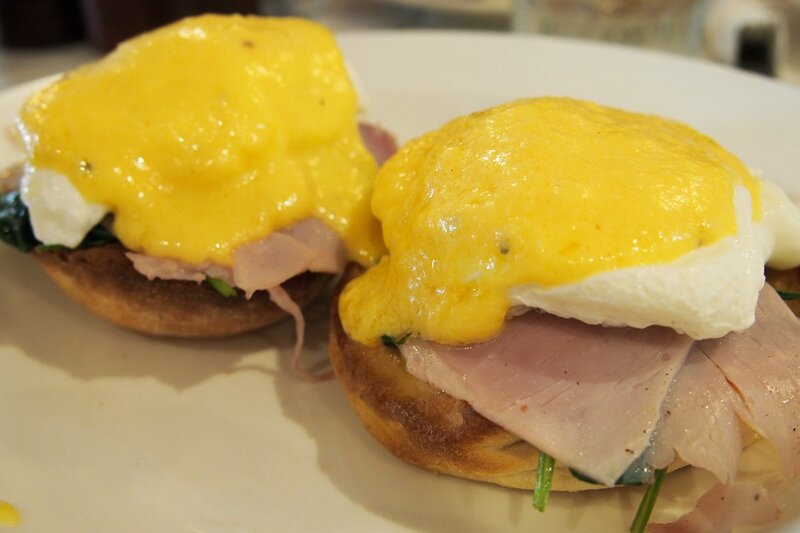 Eggs Benedict ($16 or $18 with smoked salmon) is my go-to dish when I’m unsure what to order. I’m so pleased that I defaulted to it this morning as it was one of the best, most moreish examples I’ve tasted. Strangely enough though, the hollandaise wasn’t what I would call a typical hollandaise. So often I argue “don’t mess with the classics” but this thicker, super rich hollandaise has proven me wrong in this case. I begrudgingly shared a few measly forkfuls with my guests but relished every bite that was left. 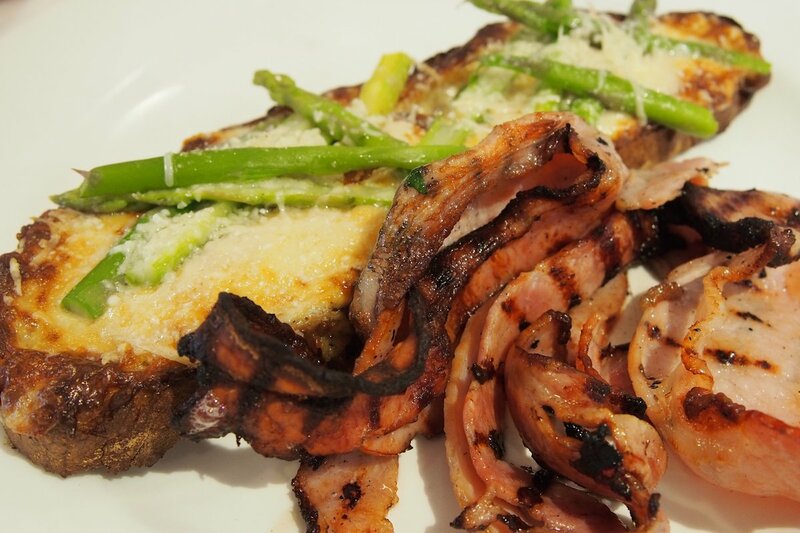 The Welsh rarebit & asparagus ($14) was outstanding (and done correctly according to British friends). This, again, was just a half serve but still sizeable especially with the side of bacon. Rich, cheesy and prepared without anything to fault, the rarebit brought a smile to the face of everyone who tried it. I’ve been to Bar Mattino a few times since my last review and every visit has been outstanding. If you’re after a breakfast spot that gets it right every time, you’ve found it.